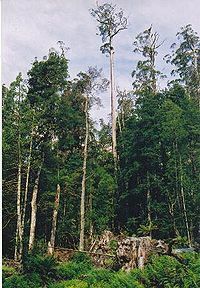 Several eucalypt species are among the tallest trees in the world. Eucalyptus regnans, the Australian 'mountain ash', is the tallest of all flowering plants ( angiosperms); today, the tallest measured specimen named Centurion is 100.5 m (330 ft) tall. Coast Douglas-fir is about the same height; only coast redwood is taller, and they are conifers ( gymnosperms). Six other eucalypt species exceed 80 metres in height: Eucalyptus obliqua, Eucalyptus delegatensis, Eucalyptus diversicolor, Eucalyptus nitens, Eucalyptus globulus and Eucalyptus viminalis. Most eucalypts are not tolerant of severe cold. 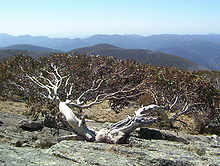 Eucalypts do well in a range of climates but are usually damaged by anything beyond a light frost of −5 °C (23 °F);    the hardiest are the snow gums, such as Eucalyptus pauciflora, which is capable of withstanding cold and frost down to about −20 °C (−4 °F). Two subspecies, E. pauciflora subsp. niphophila and E. pauciflora subsp. debeuzevillei in particular are even hardier and can tolerate even quite severe winters. Several other species, especially from the high plateau and mountains of central Tasmania such as Eucalyptus coccifera, Eucalyptus subcrenulata and Eucalyptus gunnii,  have also produced extreme cold-hardy forms and it is seed procured from these genetically hardy strains that are planted for ornament in colder parts of the world. An essential oil extracted from eucalyptus leaves contains compounds that are powerful natural disinfectants and can be toxic in large quantities. Several marsupial herbivores, notably koalas and some possums, are relatively tolerant of it. 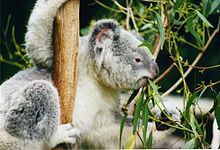 The close correlation of these oils with other more potent toxins called formylated phloroglucinol compounds ( euglobals, macrocarpals and sideroxylonals)  allows koalas and other marsupial species to make food choices based on the smell of the leaves. For koalas, these compounds are the most important factor in leaf choice. Eucalyptus flowers produce a great abundance of nectar, providing food for many pollinators including insects, birds, bats and possums. [ citation needed] Although eucalyptus trees are seemingly well-defended from herbivores by the oils and phenolic compounds, they have insect pests. These include the eucalyptus longhorn borer Phoracantha semipunctata and the aphid-like psyllids known as " bell lerps", both of which have become established as pests throughout the world wherever eucalypts are cultivated. Eucalyptus oil is highly flammable; ignited trees have been known to explode. 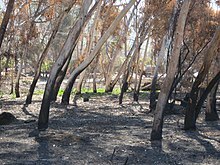 Bushfires can travel easily through the oil-rich air of the tree crowns. 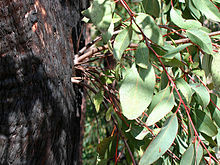 Eucalypts obtain long-term fire survivability from their ability to regenerate from epicormic buds situated deep within their thick bark, or from lignotubers,  or by producing serotinous fruits. Some species of gum trees drop branches unexpectedly. In Australia, Parks Victoria warns campers not to camp under river red gums. Some councils in Australia such as Gosnells, Western Australia, have removed eucalypts after reports of damage from dropped branches, even in the face of lengthy, well publicised protests to protect particular trees. A former Australian National Botanic Gardens director and consulting arborist, Robert Boden, has been quoted referring to "summer branch drop". Dropping of branches is recognised in Australia literature through the fictional death of Judy in Seven Little Australians. Although all large trees can drop branches, the density of eucalyptus wood is high  due to its high resin content,  increasing the hazard. Eucalypts were introduced from Australia to the rest of the world following the Cook expedition in 1770. Collected by Sir Joseph Banks, botanist on the expedition, they were subsequently introduced to many parts of the world, notably California, southern Europe, Africa, the Middle East, South Asia and South America. On the order of 250 species are under cultivation in California. In Portugal and also Spain, eucalypts have been planted in plantations for the production of pulpwood. Eucalyptus are the basis for several industries, such as sawmilling, pulp, charcoal and others. Several species have become invasive and are causing major problems for local ecosystems, mainly due to the absence of wildlife corridors and rotations management. Eucalypts have many uses which have made them economically important trees, and have become a cash crop in poor areas such as Timbuktu, Mali :22and the Peruvian Andes,  despite concerns that the trees are invasive in some countries like South Africa. Best-known are perhaps the varieties karri and yellow box. Due to their fast growth, the foremost benefit of these trees is their wood. They can be chopped off at the root and grow back again. They provide many desirable characteristics for use as ornament, timber, firewood and pulpwood. It is also used in a number of industries, from fence posts and charcoal to cellulose extraction for biofuels. Fast growth also makes eucalypts suitable as windbreaks and to reduce erosion. Eucalyptus oil is readily steam distilled from the leaves and can be used for cleaning and as an industrial solvent, as an antiseptic, for deodorising, and in very small quantities in food supplements, especially sweets, cough drops, toothpaste and decongestants. It has insect repellent properties , and is an active ingredient in some commercial mosquito repellents . 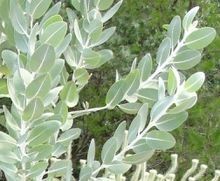 Eucalyptus globulus is the principal source of eucalyptus oil worldwide. The eucalyptus species most planted are E. grandis, E. globulus and E. dunnii; they are used mainly for pulp mills. Approximately 80,000 ha of E. grandis situated in the departments of Rivera, Tacuarembó and Paysandú is primarily earmarked for the solid wood market, although a portion of it is used for sawlogs and plywood. The current area under commercial forest plantation is 6% of the total. The main uses of the wood produced are elemental chlorine free pulp mill production (for cellulose and paper), sawlogs, plywood and bioenergy ( thermoelectric generation). Most of the products obtained from sawmills and pulp mills, as well as plywood and logs, are exported. This has raised the income of this sector with respect to traditional products from other sectors. Uruguayan forestry plantations have rates of growth of 30 cubic metres per hectare per year and commercial harvesting occurs after nine years. 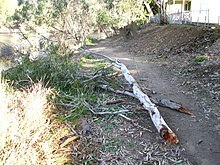 It was commonly believed that the thirst of the Eucalyptus "tended to dry up rivers and wells", creating such opposition to the species that in 1913 a proclamation was issued ordering a partial destruction of all standing trees, and their replacement with mulberry trees. Pankhurst reports, "The proclamation however remained a dead letter; there is no evidence of eucalypts being uprooted, still less of mulberry trees being planted." Eucalypts remain a defining feature of Addis Ababa. In 1777, on Cook's third expedition, David Nelson collected a eucalypt on Bruny Island in southern Tasmania. This specimen was taken to the British Museum in London, and was named Eucalyptus obliqua by the French botanist L'Héritier, who was working in London at the time. He coined the generic name from the Greek roots eu and calyptos, meaning "well" and "covered" in reference to the operculum of the flower bud which protects the developing flower parts as the flower develops and is shed by the pressure of the emerging stamens at flowering. It was most likely an accident that L'Héritier chose a feature common to all eucalypts. Eucalyptus rubida ( candlebark gum) in Burra, New South Wales. ^ Eyles, A; et al. (2009). "Role of corticular photosynthesis following defoliation in Eucalyptus globulus". Plant, Cell & Environment. 32 (8): 1004–1014. doi: 10.1111/j.1365-3040.2009.01984.x. PMID 19344333. ^ Saveyn, A.; et al. (Summer 2010). "Woody tissue photosynthesis and its contribution to trunk growth and bud development in young plants". Plant, Cell & Environment. 33 (11): 1949–1958. doi: 10.1111/j.1365-3040.2010.02197.x. PMID 20561249 – via Wiley. ^ Gandolfo, MA; Hermsen, EJ; Zamaloa, MC; Nixon, KC; González, CC; et al. (2011). "Oldest Known Eucalyptus Macrofossils Are from South America". PLoS ONE. 6 (6): e21084. Bibcode: 2011PLoSO...621084G. doi: 10.1371/journal.pone.0021084. PMC 3125177. PMID 21738605. ^ Eschler, BM; Pass, DM; Willis, R; Foley, WJ (2000). "Distribution of foliar formylated phloroglucinol derivatives amongst Eucalyptus species". Biochemical Systematics and Ecology. 28 (9): 813–824. doi: 10.1016/S0305-1978(99)00123-4. PMID 10913843. ^ Fradin, Mark S.; Day, John F. (7 October 2009). "Comparative Efficacy of Insect Repellents against Mosquito Bites". New England Journal of Medicine. 347 (1): 13–18. doi: 10.1056/nejmoa011699. PMID 12097535. ^ a b J., Ribeiro, C.M., 1999. Tendencias y perspectivas de la economı ́a forestal de los países del Conosur ( Argentina, Brasil, Chile, Uruguay). Oficina Regional FAO para America Latina y el Caribe, Santiago, Chile. ^ a b Aggangan, R.T.; o’Connell, A.M.; McGrath, J.F. ; Dell, B. (1999). "The effects of Eucalyptus globulus Labill. leaf letter on C and N mineralization in soils from pasture and native forest". Soil Biology and Biochemistry. 31 (11): 1481–1487. doi: 10.1016/S0038-0717(99)00052-8. ISSN 0038-0717. ^ Grierson, P.F; Adams, M.A (2000). 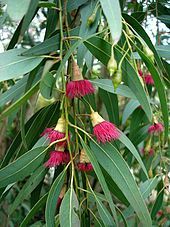 "Plant species affect acid phosphatase, ergosterol and microbial P in a Jarrah (Eucalyptus marginata Donn ex Sm.) forest in south-western Australia". Soil Biology and Biochemistry. 32 (13): 1817–1827. doi: 10.1016/S0038-0717(00)00155-3. ISSN 0038-0717. ^ a b Bernhard-Reversat, France (1999). "The leaching of Eucalyptus hybrids and Acacia auriculiformis leaf litter: laboratory experiments on early decomposition and ecological implications in congolese tree plantations". Applied Soil Ecology. 12 (3): 251–261. doi: 10.1016/S0929-1393(99)00005-0. ISSN 0929-1393. ^ Madeira, M.A.V. ; Andreaux, F.; Portal, J.M. (1989). "Changes in soil organic matter characteristics due to reforestation with Eucalyptus globulus, in Portugal". Science of the Total Environment. 81–82: 481–488. Bibcode: 1989ScTEn..81..481M. doi: 10.1016/0048-9697(89)90157-5. ISSN 0048-9697. ^ Altesor, A.; Di Landro, E.; May, H.; Ezcurra, E. (1998). "Long-term species change in a Uruguayan grassland". Journal of Vegetation Science. 9 (2): 173–180. doi: 10.2307/3237116. ISSN 1100-9233. JSTOR 3237116. ^ Carrasco-Letelier, L.; Eguren, G.; Castiñeira, C.; Parra, O.; Panario, D. (2004). "Preliminary study of prairies forested with Eucalyptus sp. at the northwestern Uruguayan soils". Environmental Pollution. 127 (1): 49–55. doi: 10.1016/S0269-7491(03)00258-6. ISSN 0269-7491. PMID 14553994. ^ Céspedes-Payret, Carlos; Piñeiro, Gustavo; Gutiérrez, Ofelia; Panario, Daniel (2012). "Land use change in a temperate grassland soil: Afforestation effects on chemical properties and their ecological and mineralogical implications". Science of the Total Environment. 438: 549–557. Bibcode: 2012ScTEn.438..549C. doi: 10.1016/j.scitotenv.2012.08.075. ISSN 0048-9697. PMID 23064181. ^ Farley, Kathleen A.; Piñeiro, Gervasio; Palmer, Sheila M.; Jobbágy, Esteban G.; Jackson, Robert B. (2008). "Stream acidification and base cation losses with grassland afforestation". Water Resources Research. 44 (7): n/a. Bibcode: 2008WRR....44.0A03F. doi: 10.1029/2007WR006659. ISSN 0043-1397. ^ "Lives of the trees: an uncommon history". Choice Reviews Online. 47 (10): 47–5641–47–5641. 2010-06-01. doi: 10.5860/choice.47-5641. ISSN 0009-4978. ^ a b Roza I. M. El-Eini (1999). "British forestry policy in Mandate Palestine, 1929–48: Aims and realities". Middle Eastern Studies. 35 (3): 72–155. doi: 10.1080/00263209908701280. ^ Sax, Dov F. (2002). "Equal diversity in disparate species assemblages: a comparison of native and exotic woodlands in California". Global Ecology & Biogeography. 11: 49–57. doi: 10.1046/j.1466-822X.2001.00262.x. Myburg, Alexander A.; et al. (2014). "The genome of Eucalyptus grandis". Nature. 510 (7505): 356–362. doi: 10.1038/nature13308. PMID 24919147. Bennett, Brett M. (2010). "The El Dorado of Forestry: The Eucalyptus in India, South Africa, and Thailand, 1850–2000". International Review of Social History. 55: 27–50. doi: 10.1017/S0020859010000489. Lucid Online Player - EUCLID Eucalypts of Australia ( Multi-access key to 917 species/subspecies taxonomy as of December 2009.